I used to think that foods high in uric acid were the most important aspect of managing gout diet. I first published my list of foods high in uric acid on July 22nd, 2007. It took a lot of research to bring the science of purines into one list, and it’s been copied by thousands of websites around the world. At the time, after 2+ years working on this site, I knew more about gout than most people. A fraction of what I know now. See Foods High in Uric Acid summary. I soon learned that purine control was not as important as many people suggested. You should never ignore purines from animal flesh. But there are other factors in diet that are more important. I’ve created a better Purine Rich Foods list that focuses on foods that really matter. You can still read my original high purine foods list below. However, it is best used as a historical reference for the way we used to believe diet can affect gout. We now know that vegetable purines have no effect on gout. Today, I’m making it clear. This list of foods high in uric acid is never ever going to help your gout, except as an example of what not to do. I’ll explain why after the chart that you are so desperate to see. If you just want help now, without wasting any more of your time looking for bad gout foods to avoid, then please ask in the gout forums. If you feel that it is important to manage foods high in uric acid, then you should measure your total intake. Multiply the weight of your food (in grams) by the value from the table and divide this by 100 to give your uric acid intake in milligrams. In this way, you can calculate a total intake from the list of foods high in uric acid for every meal. You can compare purine intake totals with your blood test results to measure how food is affecting your uric acid levels. To find a particular food quickly, use your browser Find function (usually Ctrl-F). You can see that my purines table shows actual numbers. Please don’t waste your time with other food lists that only show labels such as high uric acid in food, or moderate uric acid in food. My table takes all the foods from the biggest purine database. Then I list real purine values in an easy-to-read format. That helps you plan your gout diet properly. If you are unsure about purines and foods high in uric acid, please read How Purines Affect Gout. I include purine data in my nutrition summary for gout food. So, to see your favorite uric acid food, ask me to add it to the gout & uric acid food list. The total of free and bound compounds is given for each component. The “total purines” column contains the total of all individual components calculated as uric acid. The exact calculation of this is beyond the scope of this article, but you can easily see the relative purine count in the table. Remember, the table of foods high in uric acid shows the number of milligrams per 100 grams, so intake will depend on portion size. I’ve flagged this article, for review. Are you are interested in more information about beer for gout sufferers? Please share your questions, opinions, and experiences at Possible Beer and Gout review. If the amount of animal purines in your diet is high enough to significantly affect your uric acid level, then you have an unhealthy diet. I’ll help you with whichever choice you make, though I obviously recommend option 3. Some vegetarian diets, alkalizing diets, or Mediterranean style diets can be very good for gout when planned and managed properly. I specialize in tweaking these naturally healthy, low animal purine diets to match you and your gout needs. Please remember that, just as with any uric acid lowering treatment, dietary gout controls must be managed properly. If you have had gout long enough to notice it, then you have uric acid deposits throughout your body. Some of these may cause gout attacks as they dissolve. You might avoid this if you are lucky, but for most people, a low uric acid diet is going to hurt before it gets better. I understand every aspect of this, and I want to help you make the right choices. As you and your doctor work together to control your gout. It’s a serious matter, and I have a seriously good gout forum. In that forum, and new related personal gout support services, you can get the personal help you need to make healthy choices about foods high in uric acid. I want to make that help more accessible to you, so I’m going to end this latest revision to my worst page on gout. Expect some better help soon on what you should do next after reading about high purine foods. I’ve left most of my original page below – more revisions coming soon. I urge you to get help with your foods high in uric acid by asking in the gout forums, or by clicking the orange Support button. Foods high in uric acid affect every gout sufferer differently. Some gout sufferers need to control uric acid food intake carefully. Others need to focus on different dangers in food and drink. I’ve added links at the end of the article where you can get personal help for foods high in uric acid. Actually, food never contains uric acid, it contains something called purines, and your body converts purines to uric acid. This is important! Because excess uric acid is what causes gout. I have 2 surprises for you about purines. The first surprise about high uric acid foods is: vegetable purines are not important! Yes, that’s right! Vegetable purines do not increase uric acid in our bodies, and they can be ignored. You might need to be careful with foods high in animal purines, but there is no evidence to show that foods high in vegetable purines will increase uric acid. I have updated the foods high in uric acid table with my Purine Rich Foods chart to only show animal purines that affect gout. You can still see the original foods high in uric acid chart below. The second surprise is: though eating animal purines can raise your uric acid level, it has no immediate effects on gout attacks. 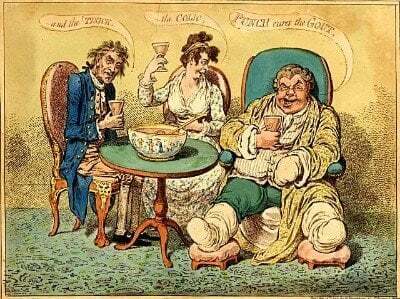 That’s right – high purine meals do not cause gout attacks! However, they can raise the risk of gout attacks over several months. The latest science shows that it is a different food component that triggers gout flares. You will not get any immediate gout flare reduction from reducing purine intake, and you can only measure results of purine changes by getting your blood tested for uric acid. Dietitians and nutritionists commonly measure foods high in uric acid by measuring the total purine content of food. The table below lists foods high in uric acid first with purine concentration reducing as you move down the list. Many advisers tell gout sufferers to avoid anything over 400mg and restrict foods in the 100-400mg range, but you should treat this advice with caution. Firstly, you must realize that typical portion sizes vary enormously. Be sure to calculate the amount that applies to your typical serving size from the value shown for 100 grams. Secondly, the effect of foods high in uric acid depends on absorption of purines through the digestive tract. Most uric acid derives from the breakdown of your cells as part of normal metabolism. The overall contribution of foods varies from person to person. Different gout studies report figures of between 5% and 15%. Please be careful about getting obsessed with the purine content of food. Though purines in food can have an effect on uric acid, there are many other factors to consider. Read more about the main food factors that can affect gout in the Gout Diet section. I recommend you do not take this type of food list too seriously. Firstly, gout food research indicates that vegetable purines do not increase the risk of gout, and dairy foods can actually reduce it. More importantly, people digest foods differently – a food that causes gout in one person might be tolerated by another, and different food combinations have significantly different effects. My list of foods high in uric acid is one of my oldest pages. Despite its weaknesses, I have retained this old foods high in uric acid chart. I retain it to help you understand where some of the world’s misleading gout information comes from. Don’t worry if this is confusing. Help is at hand. You have learned that you can stop worrying about vegetable purines. You also know that animal purines only increase the long-term risk of gout attacks, with no immediate attacks on gout flares. New information changes the way gout should be managed. Science tells us that gout diet must be managed on a personal basis, and total food intake is far more important than a few individual foods or drinks. I can help you understand how foods high in uric acid affect Your gout. First I help you collect important facts that you can keep in your own personal gout profile. Then I provide several places where you can discuss your gout facts to get the right gout diet for you. Start now, and ask your question about uric acid. What do you want to do next to learn about how foods high in uric acid affect your gout? Get personal help now, using the gout support links above, or read more gout diet facts. Purine control used to be considered the best way to manage your gout diet, but we now know that it is a waste of time to simply avoid high purine foods, without considering types of purine, and other diet factors. My Gout Diet guidelines help you make the most important diet choices for gout. Leave Foods High In Uric Acid to browse Gout Diet Guidelines. TL;DR - Foods High in Uric Acid: Surprisingly Bad! Food does not contain uric acid. Uric acid forms from purines in meat, fish, and our own flesh. Vegetable purines do not increase uric acid. Excess food is a bigger risk than purines because it leads to more uric acid from human flesh. Total daily and weekly diet control in a balanced diet is more important than avoiding certain foods. I supply free personal gout diet plans - just ask in the gout forum.